‘+/-‘ is an easy card game based on the theme of endangered species. 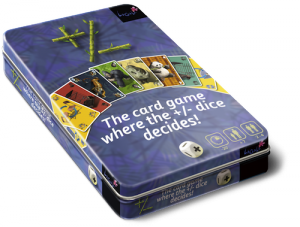 It is an addictive and interactive 2-4 player card game where players have to focus on an ever changing winning scenario. This makes ‘+/-‘ very innovative and challenging as most games stick to a fixed outcome. How to win ‘+/-‘? This is the unique thing about ‘+/-‘: it depends. At the start of the game the ‘+/-‘ dice is thrown. Depending on the result of the throw, the goal on how to win the game in unveiled. When it is a ‘+’, the players need to accumulate as many points as possible of their chosen endangered species. If a ‘-‘ is thrown the players need to accumulate the least possible points of their chosen endangered species.